During World War II, a shortage of men caused the government to form special branches for women who previously had only served as nurses. In May of 1942 a bill was passed allowing women to serve in the military and fill non-militant roles to free men to fight. The Army began taking women into the Women's Army Auxiliary Corps (WAAC). The successful women were soon needed overseas but the Army could not offer them the protection if captured or benefits if injured which Regular Army soldiers received. On 3 July 1943, after a delay caused by congressional hearings on slander issues, the Women's Army Corps (WAC) bill was signed into law. All WAACs were given a choice of joining the Army as a member of the WAC or returning to civilian life. Although the majority decided to enlist, 25 percent decided to leave the service at the time of conversion. Hope Mitchell, a free spirit to her family in Harlem Township, enlisted in the WAAC on March 13, 1943 in Columbus, Ohio. She went through basic training in Ft. Oglethorpe, GA. From there she was sent to Army Administration School in Nacodoches, Texas. From there her first assignment was in Ft. Brady, MN, in the Transportation Corps administration office. Next she went to Camp Ellis, IL, - still in transportation. She was chosen to recruit out of Detroit, MI. Then she was sent to Jackson and on to Battle Creek to open additional recruiting offices. 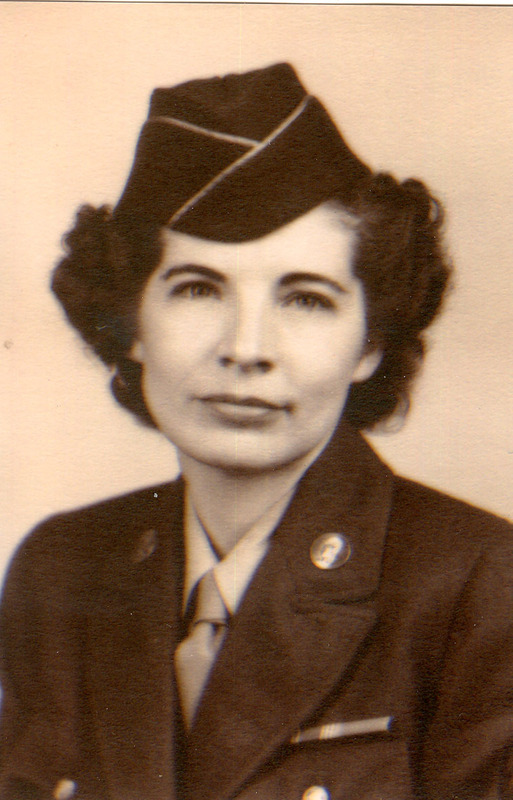 From Battle Creek she went to Kalamazoo and finally to Ft. Sheridan, IL where she was discharged October 18th, 1945. The change in policy allowed women to go overseas so Hope enlisted at Crile Hospital in Cleveland, OH, on April 28, 1946, She sailed from New York May 11, 1946, to LeHarve, France where she docked May 19th. She went from LeHarve to Frankfurt, Germany, by train with a two day lay over in Paris - which she enjoyed very much. She was assigned to EUCOM Headquarters in Frankfort. This was General Eisenhower's Headquarters and Hope got to meet the General on one occasion. When EUCOM moved to Heidelberg, Germany in 1947, Hope went with it, This is where she met her future husband, Walter Burd. In order for them to marry she had to be out of the military. She was discharged June 28, 1948 as a Tech. Sgt. Walter and Hope married December 10, 1949 in Germany. The adopted a son, Carl, in Germany. Hope received Good Conduct Metal, WAAC Service Ribbon, WWII Victory Medal, Army of Occupation Medal, and the American Campaign Medal. Hope was one of over 150,000 American women who served in the Women's Army Corps (WAC) during World War 11. Her family filled out papers for her name to be included on the Women In Military Service for America Memorial at Arlington, VA. Many thanks to Paula Scott, Hope's niece, for the extra information on Hope Mitchell.